So I was working on getting my server up with Ubuntu 9.04 Jaunty Jackalope, Server Edition, it took a little work but so far some of the things I have setup are my SSH logins, my Apache mysql and PHP server, as well as SAMBA, now what I'm working on getting setup is using the Handbrake Command Line Interface, so I'll be able to directly rip a DVD to my server, then tell the Handbrake a list of files to encode to MP4, so I can then stream them to my Xbox 360 as well as load them on my iPod Touch. I'll plan on putting up a "how to" to get through some of the things I went through to get it all up and running, it took some time but now I'm really happy with it, the only thing left with my current configuration is setting up the wifi. Once that's done I shouldn't have much work left. Follow along as I begin a series of setting up my server. 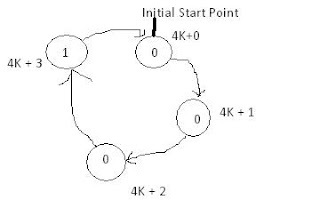 I was in my Computer Logic and Design class and was noticing something about figuring out how to setup a sequence recognizer for an equation of the form xk+z, on our last test we had the equation 4k+3, now that just plain had me stumped. Apparently the teacher had gone over a similar problem in class, but either I had not attended that day, or well I think I might have ADD because I don't think I've actually managed to follow along for an entire class ever. Back to the point of the post. additionally you would get your first 1 on the zth state. After trying to get the teacher to understand what I was asking (one reason I'm writing this blog is to learn to become better at explaining myself), she finally agreed that my assumptions were correct. Of course if you use another equation, I'm sure there will be some similar form you can probably find to break it into a when this do this type of situation. Now the teacher was going over the fact that in some situations you could factor things down and do some other stuff, but you'd have to loop through your State Diagrams more then once, provided we are treating our output as a "mealy" output, we can determine what our next course of action is based on the input and our state, if it's simply a "moore" then we HAVE to use z states, because it only cares what it's previous state was to determine the next state. I hope that is clear, if not please let me know, I would like to get better at explaining myself and any help is good help at this point!!! I don't know if anyone else out there feels the way I do, but I am from North Dakota (yes there are 2 dakotas), and I'm currently living in New Mexico, when I see a car with a North Dakota plate I always feel the urge to want to flag them down and ask them where in ND they're from. I think there needs to be a universal signal to say hey I'm from the same state as you, without having to say anything. I'm getting excited, we'll be driving up to South Dakota for a trip to see the family for memorial day weekend (We are all camping), not excited for the 10 hour drive but definitely excited to see the family. Batch Scripts Perl scripts and Bears Oh My!!! I don't know but maybe I'm the only one who has these problems but I don't know how many times I'll run a batch script and find that it's managed to start run and close before I even saw the screen come up, now of course you can get around this by putting a pause in your script, but honestly I don't always want to pause I just want to see that it successfully completed and not wait for me to hit enter. Purpose: The point of this is to make the window stay open when you run a batch file. Now to explain, what I have set it to do is to basically keep the window open after running so you are returned to a command prompt. Another place I find this to be very helpful is for example if you're using perl scripts right? How many times do you run a perl script (to test) just by double clicking on it, and it opens calls an error and closes before you get a chance to even look at it? Of course yours may have looked a little different BEFORE but in order to enable the window to stay open when you run the script you basically use the same thing what we're saying is open a command prompt (and stay open), /k says "run the following command" which happens to be the perl %1 and as a reminder the %1 is a parameter passing in what was called to it. I hope you enjoyed and let me know how it works for you!!! 7. 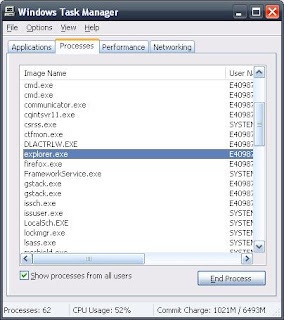 For Action name, Just name it something you'll remember like "command prompt"
Time to explain what I had you put in the application used to perform. 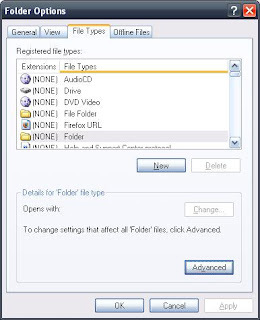 cmd.exe opens your command prompt, /K means "run the following" and the following is cd %1, cd means change directory, and %1 means what was passed to the command in this case the folder location (I.E. c:\New Folder). I hope this helps some people out there, let me know how it works for those of you who try it!!! Thank you for reading my first "real" post. First, let me introduce myself. My Name is Tyson Bailey, I have always had an interest in all things Computer/Electronics, Cooking, Photography, and Cars, I'm sure there are more but I can't seem to think of any. The purpose of this site is to improve my writing on more technical related matters, I will be writing on various topics, including my schooling, ideas I have in general, and projects I am/have and want to work on. I hope you find what I have to say interesting and I'll try to keep the content fresh and updated, hopefully providing an enjoyable experience for you the reader.